Let me tell you about one of my dear friends from college…Laura. A touch here, a lunch there, and soon an affair ensued. Laura packed her bags, left her marriage, her job, and her hometown to move to greener pastures. But the greener pastures weren’t so green. Thorns infested the relationship. Bob wasn’t interested in anything long term. Laura was just a young plaything he toyed with on weekends. What promised to be an exciting life away from small town America, away from a mundane, monotonous marriage, turned into a deep, dark pit of regret and remorse. Laura discovered Bob wasn’t anything special. He was just someone different—a diversion. And she was his flavor of the month. Sometime during her fifth year at her new church, she met a wonderful Christian man, Peter. After they were married, Laura and Peter committed their lives to serving God wherever He led. After a missions trip to Eastern Europe, they both felt God calling them to return on a more permanent basis. Now, for more than 15 years, Laura and Peter have been serving God in Eastern Europe, planting churches and loving people to Christ. She has agreed with Paul who wrote, “This one thing I do, forgetting what lies behind and straining toward what lies ahead” (Philippians 3:13). But friend, it is a choice. See, God doesn’t just set us free from our shameful past. 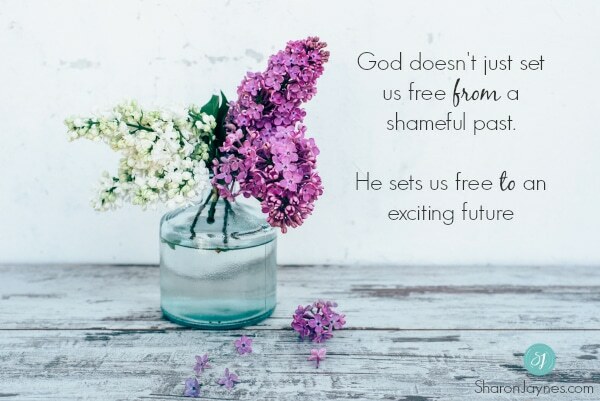 He sets us free to an exciting future. And Jesus showcased the woman caught in adultery in John 8 and my friend, Laura, to show us how. If this gives you hope, leave a comment thanking God for grace! 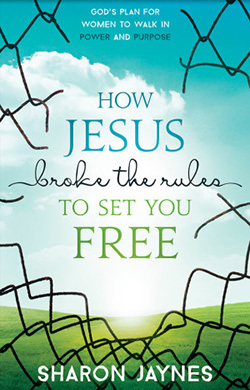 Today’s blog was adapted from my book, How Jesus Broke the Rules to Set You Free: A Woman’s Walk in Power and Purpose. In this book we study each woman Jesus encountered in the New Testament and see how her story is your story. Jesus came to set women free! In a day when they moved about as shadows in the culture, rarely seen and seldom heard, Jesus broke the cultural rules to heal them, save them, and then send them. He risked His reputation to save theirs…and yours. The book comes with a study guide and is perfect for women’s Bible study groups. But be prepared, you’ll fall in love with Jesus all over again. Click on the book to watch the book trailer. That is a blessing in itself! Right now, this book is on sale for 33% off. Thank for today’s message. This message is all I need today. I have been so depressed and frustrated since my husband left me for another woman. I felt worthless and no good. Tried to get over him on my own and made several mistakes and it was difficult to forgive myself. I sincerely thank you for this message. Thank you for this encouragement , this could of been written about my daughter who is still struggling with the scarlet letter on her chest. I hope to share this with her. Thank you for your Amazing Grace, Lord!! I Thank You God for Grace! Thank you God for your unwaivering grace. It took me years to fall in love but the sad the I gave i too quickly. I felt what I wanted to feel. I saw what I wanted to see. Learning I was not in a relationship was a very hard blow. I was just a found out that I was a means to an end and it hurt me to my core. I now know to put God First in anything I do and say. I stop ask why did this man do this to me! God will take care of the righteous. I will not be that sad person ever again. Sharon, what a beautiful testimony to the redemptive work of Christ! I love this! Praise his Holy Name for all that he is and all that he does! Thank you for sharing! I am going though the same struggles. I have been married for 17 years and seem like I am missing out on life. I am believing God will fill the void and that I will be satisfied with my life as a wife and mother. Thank you Sharon. I love the way you write. God has blessed me with a wonderful life, one husband, one son, one daughter with one spouse each, we are so blessed; and most importantly ONE SAVIOR, JESUS CHRIST OUR LORD !